Does living in an EU member state give citizens a more positive view of the EU? Rosalind Shorrocks and Roosmarijn de Geus show how extended exposure to European Union membership positively affects pro-EU attitudes. A wave of Euroscepticism has swept through the countries of the European Union with Brexit its ultimate manifestation. Nevertheless, in a recent study we find that living in the EU has a positive impact on people’s attitudes towards their country’s EU membership. Depending on their age and the point in time in which their country joined the EU, citizens have lived for longer or shorter periods of time in EU member states. We use the Eurobarometer for 15 Western European countries in the period 1973-2013 to compare the attitudes of citizens who have lived for longer and shorter time periods in EU member states. We show that citizens who have spent a greater number of years living in an EU member state are more positive about their country’s membership of the EU than citizens who have spent a shorter number of years living in an EU member state. 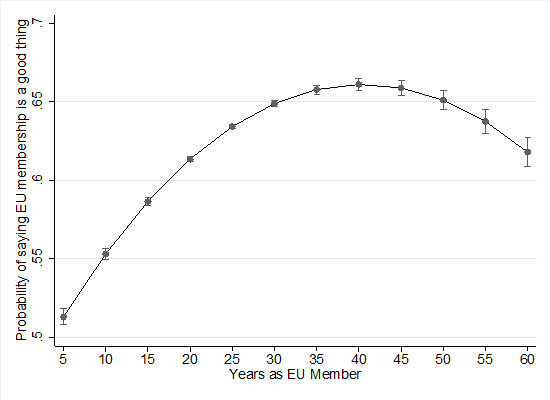 Using a regression model of EU support that accounts for age differences, as well as variation in support over time and between countries, we find that someone who has spent 40 years as an EU citizen is around 15 percentage points more likely to state that EU membership is a good thing compared to a citizen who has only spent 5 years in the EU. This is displayed in the figure below. Source: Author’s own analysis of Eurobarometer data, 1973-2013, in 15 countries: France, the Netherlands, Italy, West Germany, Belgium, Luxembourg, the UK, Ireland, Denmark, Greece, Spain, Portugal, Austria, Sweden, and Finland. We also see that this relationship flattens out after 45 years and decreases after 55 years of living in an EU member state. This could reflect diminishing returns to EU membership, where extra years as an EU citizen no longer have any additional effect on support for the EU. What’s more, only the “founding nations” of the EU – France, Germany, Italy, the Netherlands, Belgium, and Luxembourg – have citizens who have lived for longer than 45 years within an EU country. We argue that such a positive socialisation effect comes from citizens developing a familiarity with the EU. Citizens within the EU are generally not aware of the intricacies of EU legislation and policy-making, and are of course not involved in negotiations or the drafting of treaties. Nevertheless, they do have frequent interactions with the EU and their daily lives are permeated by European influences. In 19 out of the 28 member states, citizens use the euro. Citizens in EU countries can purchase European products in supermarkets, vote in European elections, travel to other EU countries freely, and encounter other EU nationals on a regular basis. We argue these daily interactions with the EU affect attitudes through ‘mere exposure’, a well-established mechanism whereby familiarity breeds affection. In this case extended exposure to the European Union through daily interactions results in a positive disposition towards EU membership. We have also examined whether having EU-related experiences – such as EU membership, referendums, or joining the EU – during one’s “formative years” are relevant for EU attitudes. The formative years are usually thought of as adolescence and young adulthood, when people’s attitudes and opinions are formed by the context around them. We find that such experiences are largely irrelevant for people’s EU support. Even those who spent their formative years within an EU member state are no more supportive of the EU than those who did not once we properly account for over-time and cross-national differences in support for EU membership. What matters for EU support is continued exposure to the EU for a number of years. Our findings might seem contradictory in light of the prominent trend of Euroscepticism. It is important to note however that our findings do not suggest that citizens become Europhiles over time. Instead, they suggest that the experience of living in an EU member state affects attitudes toward the EU and that until now this effect has been positive. It is an open question whether this effect will continue to be positive and whether this positive effect replicates beyond our sample of Western European countries. Most importantly, our research suggests that citizens are not unaffected by living in the European community; on the contrary, their attitudes are shaped by it. For those concerned about the future of the EU in a context of rising Euroscepticism and populist, anti-EU parties, these findings offer some hope. The experience of EU membership for citizens seems to have a broadly positive effect on their attitudes towards membership of the organisation. However, it remains to be seen whether this will continue in light of more recent events within the EU, especially the financial crisis, economic austerity, and Brexit. Rosalind Shorrocks is a Lecturer in Politics at the University of Manchester. She works on gender and politics in Britain and comparatively, and on electoral politics, political behaviour, and social attitudes more broadly. She has published on the gender gap and generations in Europe and Canada, as well as on British politics and elections. Roosmarijn de Geus is a Postdoctoral Fellow at the University of Toronto. She works on elections and political behaviour in North America and Western Europe as well as the role of women in politics. She has published on democratic accountability and electoral politics in Europe and Canada.